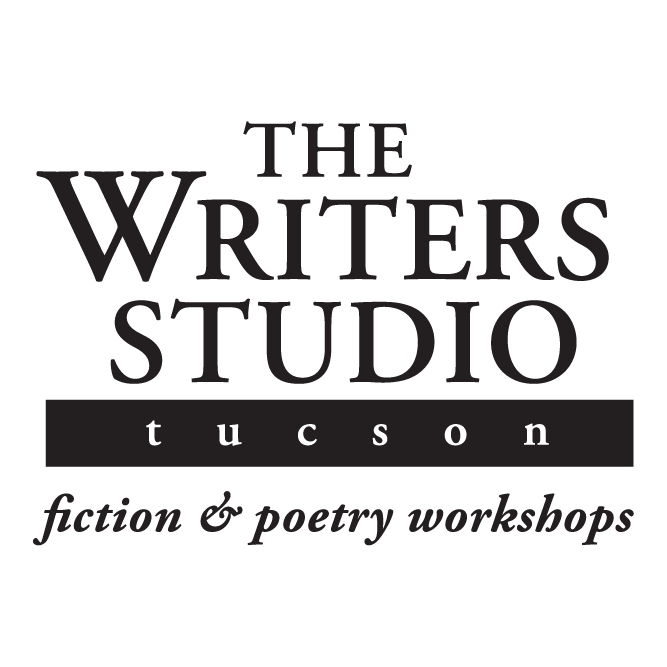 I just completed teaching an 8-week summer session at Writers Studio Tucson. I had a great class with really talented students who worked extremely hard to develop their craft and produced some stunning material. 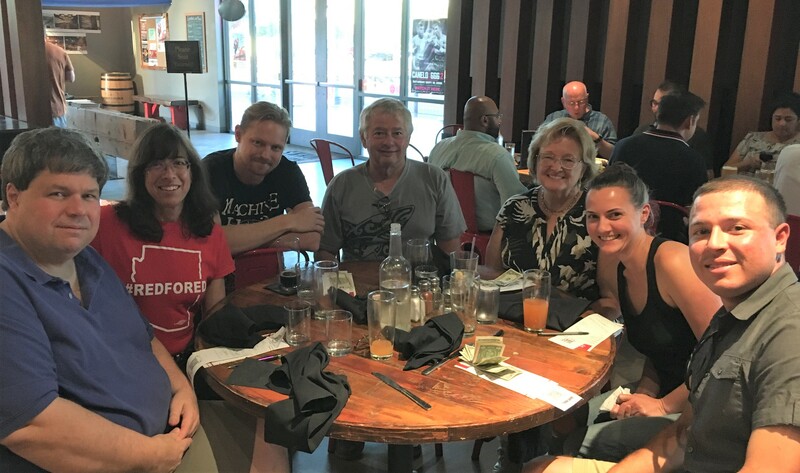 Here we are meeting for a final pre-class bite at Brother John’s on Stone Avenue. The Writers Studio, founded in 1987 by Pulitzer Prize winning poet Philip Schultz, offers ongoing writing workshops — both on site and online — designed to help students discover and nurture their own voices. 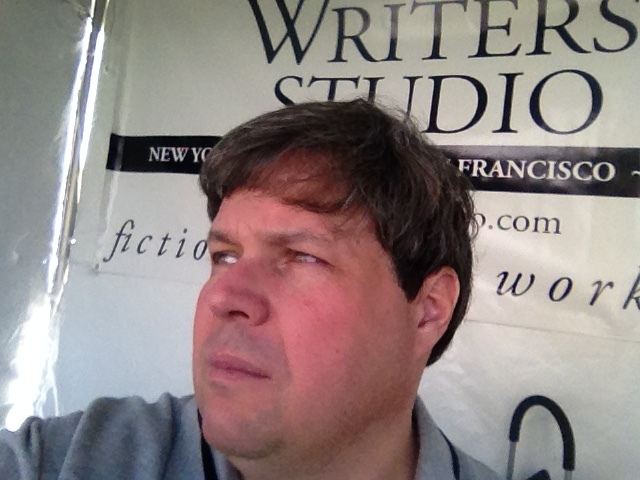 We welcome students at all stages, from those who have only dreamed of writing fiction or poetry to those with MFAs hungry for additional serious, ongoing instruction. Students provide the desire to write and the willingness to learn, and we provide the structure, the technical know-how, the professional feedback and the friendly community to enable them to reach their full potential. Our fall session starts in late September. 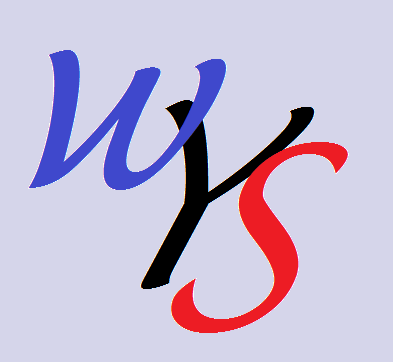 Visit our web site at Writers Studio and sign up for a class today! If you don’t live in a city that offers in-person classes, try one of our online sessions. 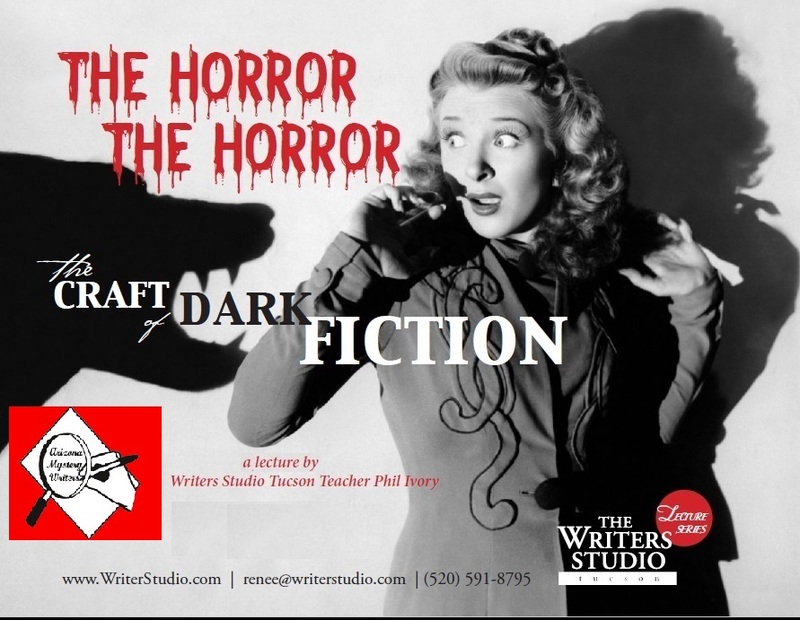 My thanks to my friends at A rizona Mystery Writers for inviting me on April 14 to deliver a reprise of the “Craft of Dark Fiction” lecture I gave for Writers Studio last December. My friend Bill Adams is a longtime member and accomplished writer who initially approached me about repeating this lecture for his group. My thanks to him and also to the group’s workshop chair Kay Lesh who made the arrangements with me. Thanks also to another good friend and outstanding writer, Alice Hatcher, for helping with the audiovisual aspect of my lecture. The lunch was tasty, the meeting was fun and the group was attentive and appreciative. I was speaking about horror fiction, which often intersects with mystery, although the two genres can also seem like two very different worlds. 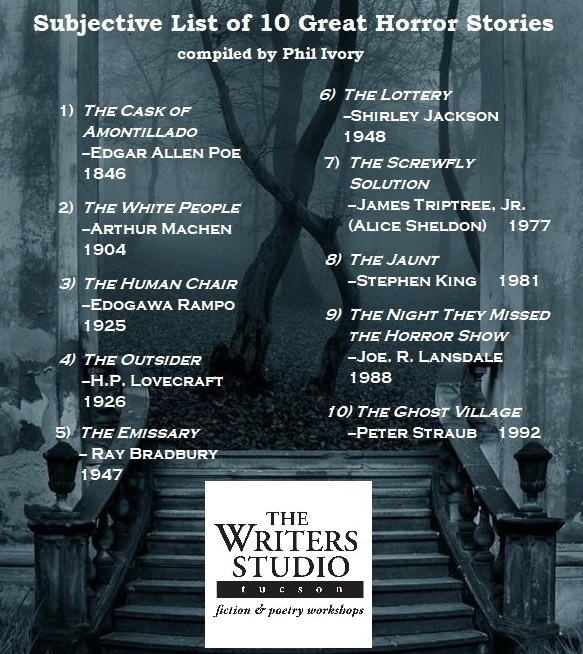 Just for fun, I created and handed out the flyer below, a personal list but one that name checks examples of short writing in the dark fiction field that have impressed and influenced me. Check it out. 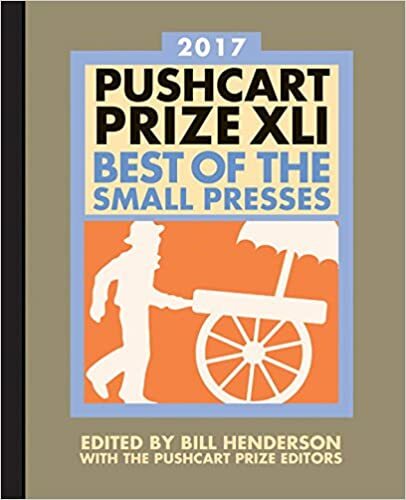 Calling all Tucson-area writers and devotees of the scary and macabre! Come out and hear me, Phil Ivory, deliver a special free lecture at 2:30 on December 9, 2017 at the Himmel Park Library here in Tucson. It’s part of the Writers Studio lecture series. It should be fun, inspirational and a little bit scary! From William Faulkner to Shirley Jackson to Margaret Atwood, writers have achieved memorable effects by putting characters in extreme situations and evoking sensations of fear, dread, awe and horror. In this Writers Studio lecture, we’ll look at horror not as something confined to the macabre shelf but as an emotion that will add power and resonance to any material regardless of genre. We’ll talk about using description to evoke a dark and lingering mood. 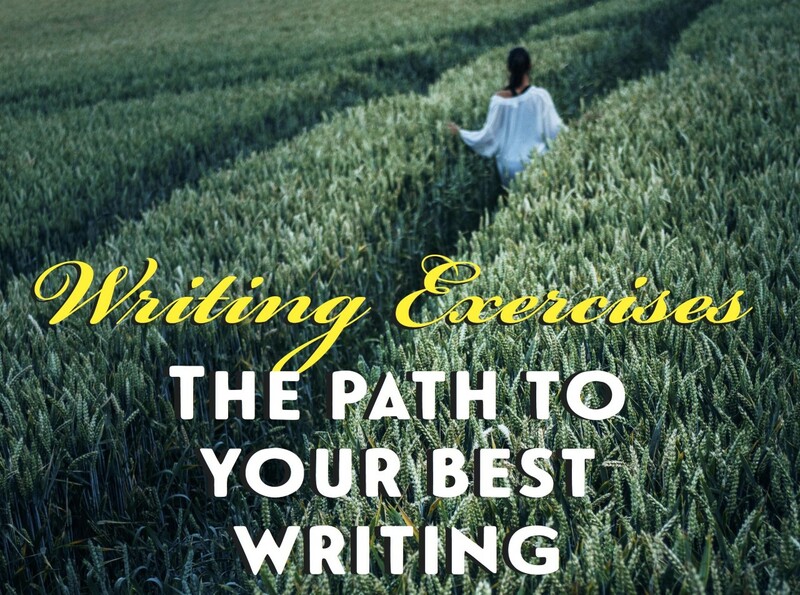 Crafting the best narrator to evoke singular emotional effects. Laying groundwork for readers to have a powerful emotional experience while never telling them what to feel. 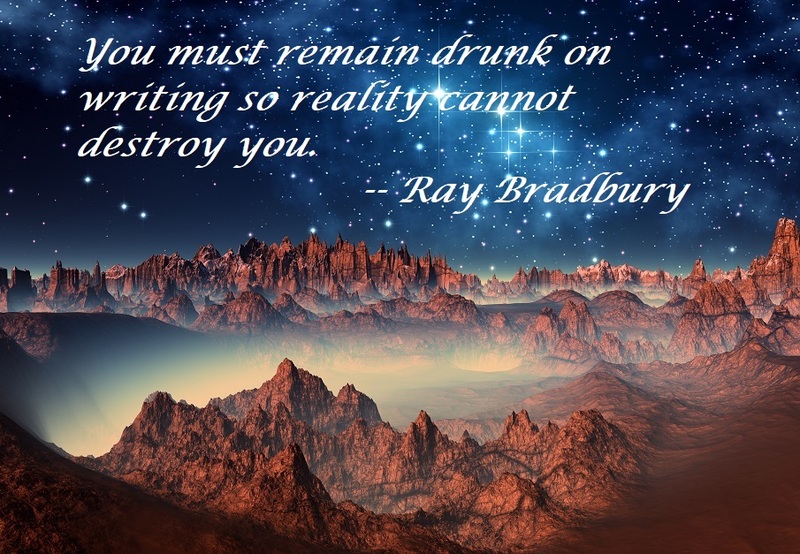 So take a writing journey to the dark side, and come back stronger than you were before. Hope to see you there on Dec. 9! And while you’re at it, why not sign up for one of our upcoming Writers Studio Winter classes? Show the world how scarily creative you really are.